Being incarcerated is never good but getting locked up in Thailand is a particularly bad idea. The country’s prisons consistently feature prominently on lists of the world’s worst. Conditions for inmates are notoriously harsh and contact with the outside world is minimal. Which is why when I got the offered a boxing match inside Klong Prem Central Prison in Bangkok, as part of Thailand’s Prison Fight charity program, I knew it was too good an opportunity to turn down. I’ve always had an adventurous streak and I try to write about stuff that is exciting and interesting. It’s how I ended up running for my life along with a bunch of terrified Thai journalists during an artillery bombardment on the Cambodian border a few years ago, and it’s a habit that has gotten me some good stories over the years but has also been known to get me in trouble. At least this time I had a very specific idea of what kind of trouble I would be getting myself into: a four-round boxing match with an Iranian inmate. On the one hand, I had boxed a couple of times before and while I’m never going to be great at it, I’m not a complete beginner. On the other hand, I only weighed around 70 kilograms, 10 kilograms less than my opponent. Ten kilos is three divisions’ difference in boxing, but then my opponent had never fought before, so I figured we were even. My plans went a bit-pear shaped at the press conference when I was told that the Iranian had committed some sort of disciplinary offence and would no longer be allowed to box. Taking his place would be a Thai inmate. I was terrified. Fighting a bigger but comparatively unskilled opponent didn’t worry me, but I’d been watching fights in Thailand long enough to know that you should never, ever underestimate a small Thai. They might be old, out of shape, and 30 years past their prime, but Thais start fighting so young that they will sometimes have 200 bouts under their belt by the age of 16. When we got into the prison that day, after handing over all our phones at the front desk, stepping through a metal detector, and submitting to a thorough search, we saw straightaway that the inmate boxers were everything we could have possibly expected and feared. Covered from neck to toe in crude prison tattoos they stood in a line being addressed by one of the guards and looked mean and ready. All, that is, except one, who stood out because his body was completely free of artwork and he looked out of shape and out of place. After a quick enquiry in broken Thai it came out that this was the guy I would be fighting. He turned out to be extremely friendly. He embraced me warmly and explained that he was seven years into a 30-year sentence for drug offences and wouldn’t see the outside of the prison walls until he was nearly 60. I established that he didn’t have a glorious fighting career buried somewhere in the distant past and that his sole experience consisted of a handful of boxing matches in the prison. He couldn’t stop putting his arm around me or making the sort of affectionate physical gestures that Thai men are prone to, so, of course, I underestimated him. Fast forward a week and I’m inside the prison, hands wrapped, ready to fight. Ever since the press conference seven days earlier I’d been completely relaxed thinking that my opponent was not a very serious boxer and that I might take it a bit easy on him. The bell sounded and we went to touch gloves and Bang!--he threw a wild combination with the clear intention of taking my head off. It didn’t hurt but it’s not what I had expected, and it seemed he’d succeeded in lulling me into a false sense of security before trying his upmost to knock me out. Unfortunately the initial shock never quite wore off. The fight wasn’t what I’d been expecting and I couldn’t seem to get into it, even though all he did is attack in wild bursts and then back off, trying to tie me up by hugging and holding whenever I came forward. After four rounds of this it was pretty clear who’d won and my opponent got a nice shiny belt for his troubles. Missing out on this was my only regret that day. I can’t imagine any circumstances under which I’m going to get to box for a title again, and that belt would have looked good on my bedroom wall. Once the fights were over and the inmates had all gone back to their cells (though not before being thoroughly frisked by the guards), we got to have a look around the block that houses all the Muay Thai fighters and boxers including my opponent. While the atmosphere at the fights was relaxed and everyone seemed to be having a good time it soon became clear that this was no more than a rare respite from an otherwise brutal regime. The cells in Klong Prem are tiny, about half the size of my bedroom, and they all house three to four prisoners. There's is no furniture, everyone sleeps together on the stone floor, and there’s no privacy: The toilet and shower area at the back of the cell is partitioned by a wall barely a metre high. Most of the inmates we talked to were in for drugs offences, with sentences ranging from 30-100 years. I’m disappointed in my own lackluster performance inside the ring, but I can’t begrudge my opponent his victory. The 12 minutes he’d spent boxing with me must have been one of the highlights of his life inside Klong Prem. 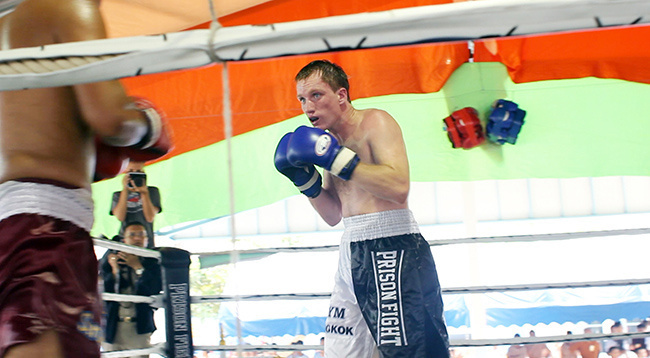 Look out for our video on Thai Prison Fights coming soon. In the meantime check out the trailer here.